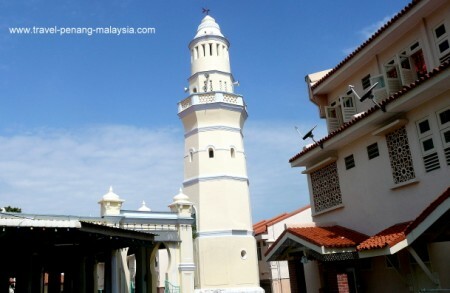 The Acheen Street Mosque, also known as the Masjid Melayu Lebuh Acheh, is one of the oldest Mosques in Penang, dating back to 1808. 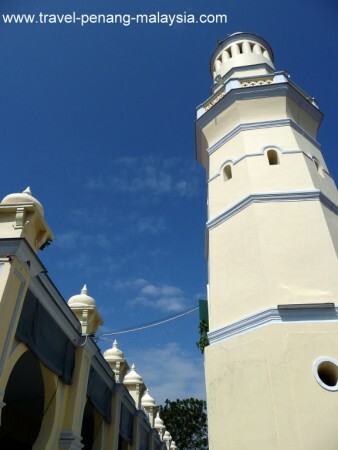 This Malay style Mosque was founded by Tengku Syed Hussain bin Abdul Rahah Aideed, a wealthy Achehnese - His tomb and those of his family can be found at the rear of the mosque. The Mosque is open to the public to you are free to wander around. Often you will find one of the men that work there, willing to give you a quick guided tour of the grounds and even take you up top of the Minaret (A small tip is expected). Surrounding the Mosque there are some lovely examples of 19th century bungalows (pictured above) that are still lived in today by the descendants of the founder of the Mosque. As with many Mosques, the prayer hall is very plain and there is really not too much to see for visitors, but it is still worth a few minutes of your time and is just a short walk away from the many other Temples in this area of George Town around Armenian Street. 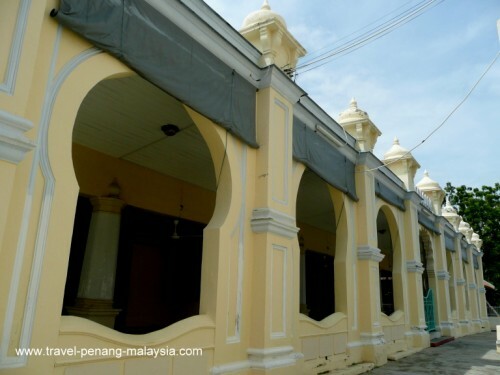 The Mosque is easy to find, located along Lebuh Acheh, it is easily visible as you walk along Pitt Street (Jalan Masjid Kapitan Keling) a couple of minutes walk past the much larger Kapitan Keling Mosque. 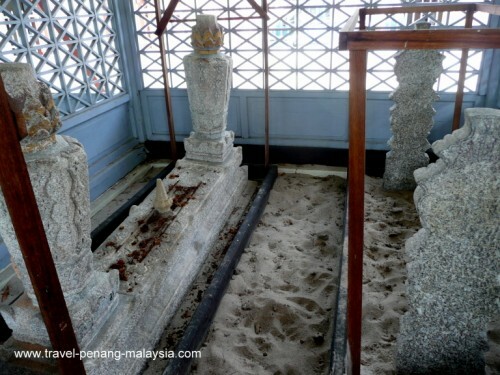 The Tomb of the Mosque's original founder, Tengku Syed Hussain bin Abdul Rahah Aideed, can be seen at the rear of the Mosque. 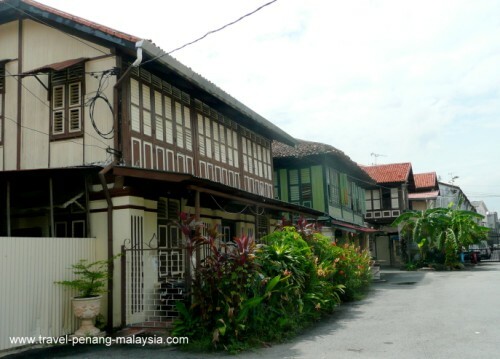 A few hundred metres up the road along Acheen Street is Tune's Armenian Street Heritage Hotel. 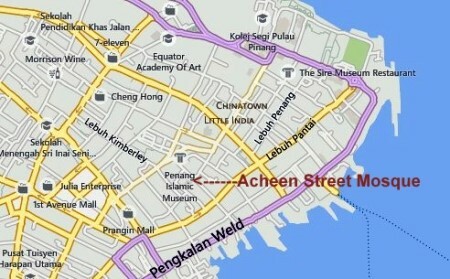 You will also find a number of places to stay along Armenian Street, just a couple of minutes walk away from the mosque. For more budget style hotels there are dozens of places in and around Chulia Street, between five and ten minutes walk away, or you can opt for the less touristy Little India area. There are many Chinese Temples and Clan houses close to this Mosque that should be visited while you are in this area of Georgetown. The closest is just a minutes walk away and probably the best Chinese Temple in Penang, The Khoo Kongsi Temple. For information and pictures of the other temples in the area, click here to visit our Chinese Temples page.